Poplar trees fall into the Populus genus, which includes Poplar, Cottonwood, and Aspen. This group of trees is known for their fast growth, toughness and low maintenance needs. 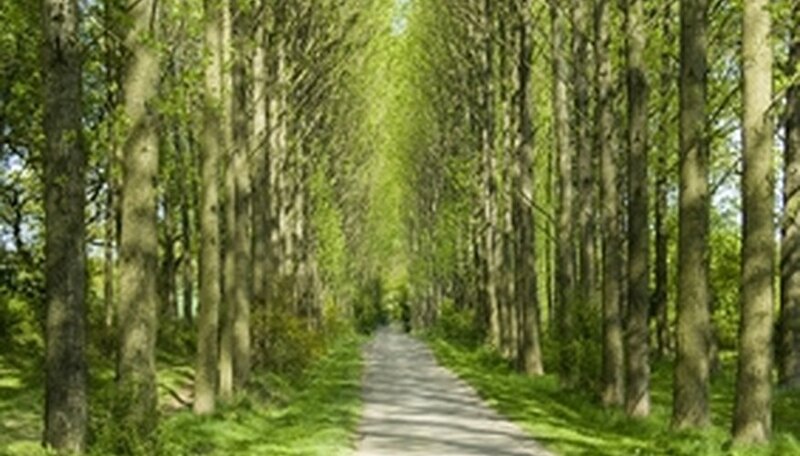 Poplars are used for wind breaks, sunscreens, to line country driveways or as background trees for shrubs and flowers. Varieties include: Lanceleaf Cottonwood; White Poplar; Bolleana Poplar; Narrowleaf Cottonwood; Balm-of-Gilead; Populus brandegeei; Carolina Poplar; Populus ‘Canescens’; Western or Fremont Cottonwood; Lombardy Poplar; Quaking Aspen; and Black Cottonwood. Poplars are tall growing deciduous trees with triangular or egg shaped leaves that are sharply pointed and glossy green or yellow in color on top and a light, pale shade below. Cottonwood varieties put off large amounts of cottony catkins that fill the air with a warm summer, snowy down. Varieties other than Cottonwood have a smooth bark that is white or grayish in color. Poplars are known for their rapid growth. When tall trees are desired in a hurry, poplars are an excellent choice, becoming large, attractive specimens in only a few years time. The shortest variety is the Quaking Aspen which grows 20 to 60 feet, while the Lombardy Poplar may reach up to 100 feet in height, and Black Cottonwood and Carolina Poplars may reach up to 150 feet. While Poplar and Aspen varieties tend to have upward narrow growth, Cottonwoods tend to be tall and bushy. Poplars have deep root systems that appreciate deep watering or a nearby water source, such as a stream or pond. Some may even go unwatered, if roots are deep enough to tap into an underground water table.Their roots may become invasive and they put off suckers, so planting near pavement, sewer lines or septic systems is not advisable. Poplars are hardy and do well in hot summer/cold winter interior regions. Varieties such as Quaking Aspen, which are native throughout the western mountains and are short lived in warmer areas; Populus brandegeei, a desert native that grows only in zones 12 and 13; and Black Cottonwood, which is native to the wet lowlands of the coastal regions are exceptions. Most varieties can be grown in all zones.